Theses posts have been published previously in this blog as an effort to expand the results of a paper I led on this matter. They deserve their own space together, to be read as a whole. 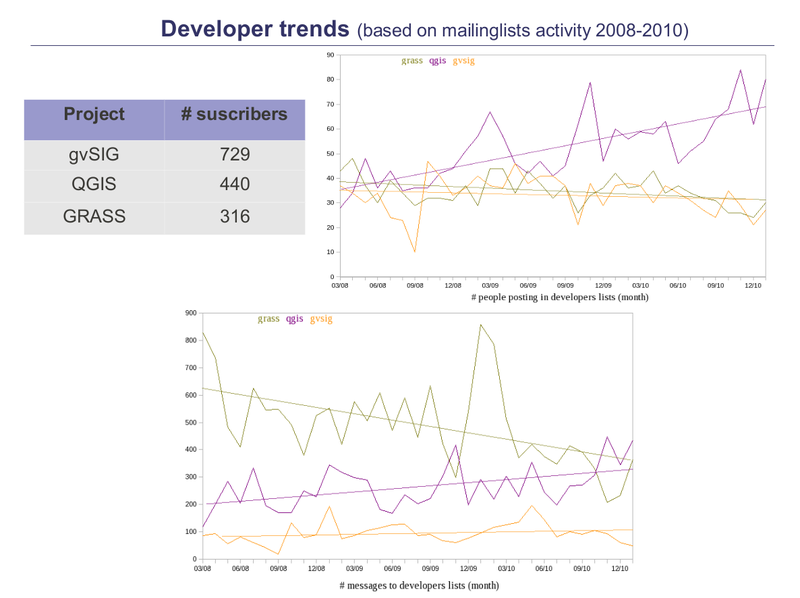 Find below the statistics for mailinglist activity in GRASS, gvSIG and QGIS during the period 2008-2010. The first one shows data from the general user mailinglists for each project. Take into account that data for gvSIG agregated both international and spanish mailinglist due the reasons stated here. The next one shows the same data (number of people writing and number of messages by month) for the developers mailinglists. Well, certainly not the user base. The data shyly introduce us the trends, not the real user base. 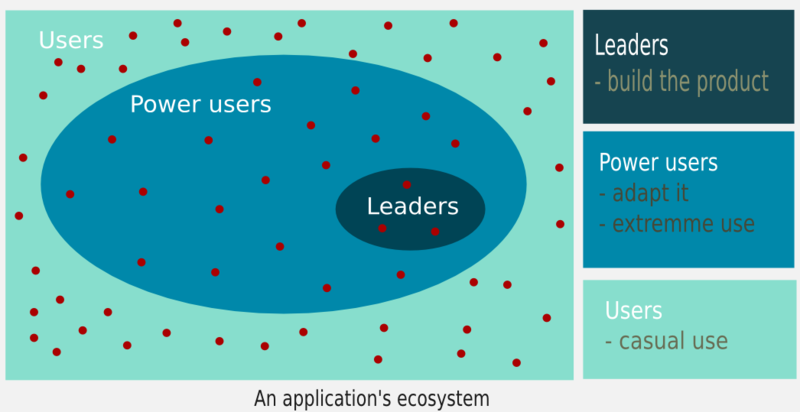 The model we adopted to study the projects reflects just a part of the community -which is arguably the engine of project- but don’t take the data as the number of users for each project. For sure, each one of our favorite projects has more users than those participating in (these) mailinglists! GRASS: it smoothly decreases in terms of number of messages as well as people writing, which happen within users and developers. The tendency is not clear though. 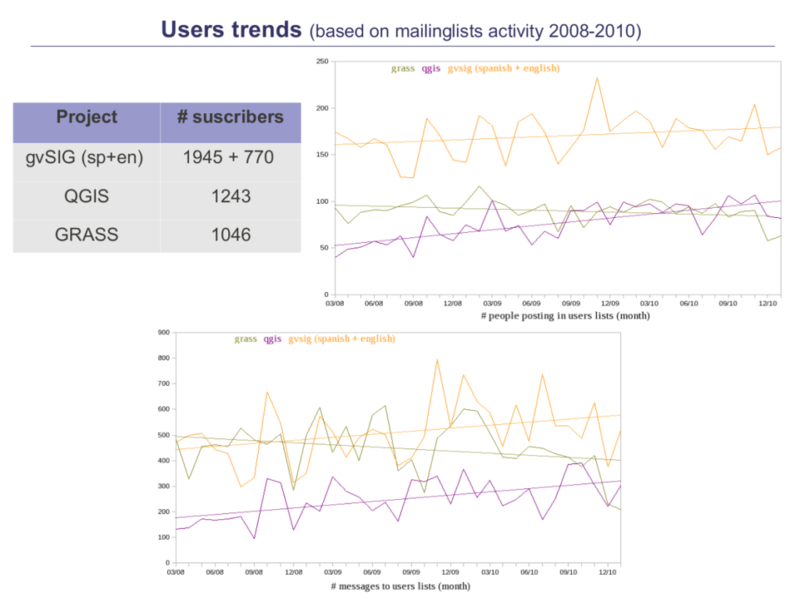 gvSIG: the data shows a steadly increasing number of users participating in the mailinglists. On the other hand, although it is the project with more people suscribed to developer mailinglist, it shows the less activity of the three projects (in terms of # of messages in developer lists): few technical conversations seemed to happen through the mailinglists during that period. QGIS: according to the data, a clear growth exists in the community. In the period in study (3 years) the number of users and developers participating in mailinglists has been doubled! Few more can be said, hope the graphics are explicative enough! Looking forward to your feedback. Images: on the left, the number of changes to the codebase (commits) agregated by year. On the right, the number of developers with at least 1 commit that year. the internal evolution of a project. how a project is doing in terms of adding new blood. It calls the atention the curve of activity in the project: growth by periods (2001-2004 and 2005-2007) with local maximums in 2004 and 2007. 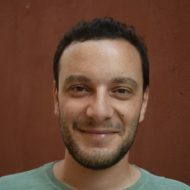 Our hypothesis was that it was due to the way the project works: the developers here make changes both in the trunk and in the branch of the product to release (be it 6.4 or 6.5) at the same time, with a lot of changesets moved between both the trunk and the branches (so doing heavy backporting). In a recently conversation with Markus Neteler, he has explained me better how they work and I guess the rhythm we see in the graphics is due to that. In terms of number of developers, GRASS has showed a continuous growth until 2008; since then, the number of regular developers stabilizes. gvSIG shows an incredible high period of activity during 2006-2008 (4500 changesets by year and most that 30 people involved!). To understand the Gauss bell of activity, is needed to know the background of the project: gvSIG development has been led by contract, which means that all activities (planning, development, testing, etc) were led by the client needs who pay for it. Only recently, these processes have been opened to a broader community (firms and volunteers collaborating in the project within the gvSIG association). So, it makes sense that the beginnings had seen less activity (high phases of planing) and afterwards they got to agregate so many people in such a short period of time. But, in 2010 it suffered a sudden stop in development (only 233 changes to the codebase were made, while a pace of 4500 changes were made during previous years). This decreasing in activity is highly correlated to the number of developers involved. It’s hard to say why it happens: could it be due to the efforts were directed to gvSIG 2.0 development? could it be due to the reorganization in the project and the creation of gvSIG asociation? Well, few can we said at this respect with the data available, further research is required to determine that. Steady grow both in terms of contributions and contributors. 2004 and 2008 years determine two peaks of activity and people participating in the development. Our preliminar hypothesys was that it was due to the release of the first stable version and the release of 1.0, as well as become an oficial project of OSGEO. Gary Sherman has confirmed that in a recent post (history of QGIS commiters) and an interview (part1 and part2). Besides, he pointed out that in 2007 the project added python support for plugin development, which possibly was one of the reasons of the growth in 2008 and afterwards. An interesting finding is that, every 4 years the project has doubled the amount of developers involved with a slower but steady growth in activity. Well, hope these graphics have helped us to understand better how is the project activity and the manpower every project is able to aggregate around it. Next posts in the serie, will focus on the developers involved and the culture surrounding them. Looking forward to your feedback! Images: on the left, number of changes to the codebase (commits) agregated by hour of day. On the right, number of commits grouped by day. This indicator is intended to give us some information on the patterns of behavior of contributors. Specifically, we can track how is a typical week for the core developers in every project: the timeline shows when the integration happened, don’t reflect the time in which the work was done; so it’s telling us the history of people with commit permissions, what we know as the leaders. Internationalization: the hourly chart represents a gauss bell centered on 15h GMT, which in most European countries would be after lunch, being morning in the Americas. That could reflect that both continents represent the vast majority of core commiters. Nevertheless, the work is relatively well distributed along different hourly zones. Volunteers: the daily chart shows a light drop of work during the weekend, likely due to hired developers or people who likely make contributions mostly within their working hours. Nevertheless, there is still a high rate of contributions being integrated during weekend, which may be a sign of a well stablished volunteer base of core-developers. Internationalization: almost all the integration happens in a journey from Monday to Friday, with a hourly range from 09:00 to 20:00 GMT. That is strongly correlated to the hours of opening of a typical shop in Spain and reflects the nature on how the application was built in that period: led by a public body which contracted development to Spanish firms. Volunteers: seems that volunteer work in core was reaching to none, which reflects the original nature of the project in that period. Internationalization: the hourly chart is nearly to a plain rate of contributions, which is a strong sign of a highly distributed leadership along the world. It’s even difficult to suggest which zones would be the prominent in terms of developers. Volunteers: the daily chart reflects a steady work along the week, with no signs of falling during the weekend, which may be related to a strong base of volunteers core commiters.